For other uses, see Bradford Bulls (disambiguation). The Bradford Bulls are a professional rugby league club in Bradford, West Yorkshire, England, currently playing in Betfred Championship. They have won the Challenge Cup five times, the league championship six times and the World Club Challenge three times. Bradford play their home games at Odsal Stadium. The team jersey is white with red, amber and black chevrons. In 1907, founder member of the Rugby Football League (RFL) Bradford F.C. switched codes to association football, and Bradford Northern (later Bradford Bulls) was formed by members who wished to continue rugby. Bradford Northern were renamed Bradford Bulls in 1996, at the start of Super League. Bradford's main rivalry was with Leeds; they also had rivalries with Halifax and Huddersfield. The club entered administration in 2012, and again in 2014 and 2016. Several bids were made to take over the club but none were accepted by the administrators, and so on 3 January 2017 the club went into liquidation. Immediately the RFL announced the criteria and invited bids to form a "new club", which ultimately acted as an immediate resurrection of the Bulls which retained the history, club colours, badge, home stadium and a several players from the 2016 squad. Due to the administration and liquidation, the club started the 2017 season with a 12-point deduction. With a few games left of the 2017 season, Bradford's relegation fears were confirmed and in 2018 they played in Betfred League One earning promotion back to the Betfred Championship after beating Workington Town on 7 October 2018. Main article: Bradford Park Avenue A.F.C. The original Bradford Football Club was formed in 1863 and played rugby football, subsequently joining the Rugby Football Union. Initially the club played at Horton Cricket Ground, All Saints Road but were asked to leave because of damage to the pitch. They then moved to Laisteridge Lane and later North Park Road in Manningham. A nomadic existence continued as they then went on to Peel Park, then Girlington and Apperley Bridge. Bradford Football Club and Bradford Cricket Club bought Park Avenue in 1879 and this resulted in the club becoming "Bradford Cricket, Athletic and Football Club". The club's headquarters were at the Talbot Darley Street, and later The Alexandra, Great Horton Road. 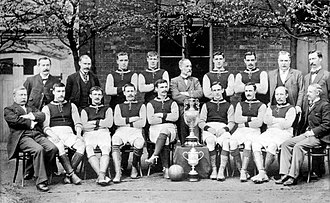 The club achieved its first major success by winning the Yorkshire Cup in 1884. In 1895, along with cross-town neighbours Manningham F.C., Bradford was among 22 clubs to secede from the Rugby Football Union after the historic meeting at the George Hotel in Huddersfield in response to a dispute over "broken time" payments to players who were thus part-time professionals. These 22 clubs formed the Northern Rugby Football Union (which eventually became the Rugby Football League) and rugby league football was born. Bradford enjoyed some success in the new competition. 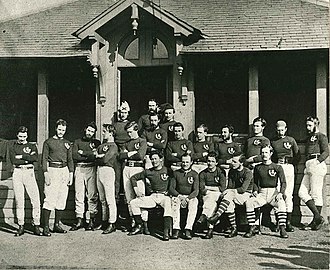 In the 1903–04 Northern Rugby Football Union season, the team finished level on points with Salford at the top of the league and then won the resulting play-off 5–0. In 1905–06, Bradford beat Salford 5–0 to win the Challenge Cup and were runners-up in the Championship. In 1906–07, Bradford won the Yorkshire County Cup 8–5 against Hull Kingston Rovers. During this time Manningham F.C. had run into financial difficulties and, despite a summer archery contest that generated enough money to ensure their survival, its members were persuaded to swap codes and play association football instead. Manningham was invited to join the Football League in 1903, in an attempt to promote football in a rugby-dominated region, and the newly renamed Bradford City A.F.C. was voted into full membership of the Second Division without having played a game of football, having a complete team or even being able to guarantee a ground. The creation of Bradford City led to demands for association football at Park Avenue too. The ground had already hosted some football matches including one in the 1880s between Blackburn Rovers and Blackburn Olympic F.C.. In 1895, a Bradford side had beaten a team from Moss Side, Manchester, by 4–1 in front of 3,000 spectators. Following the change at Bradford City, a meeting was called of the Bradford FC members on 15 April 1907 to decide the rugby club's future. An initial vote appeared to favour continuing in rugby league, but then opinion shifted towards rugby union and the chairman, Mr Briggs, used his influence to swing the committee behind the proposed move to association football. 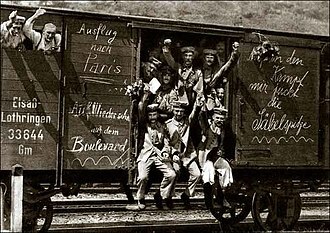 This act, sometimes referred to as "The Great Betrayal", led to Bradford FC becoming the Bradford Park Avenue Association Football Club. The minority faction decided to split and form a new club to continue playing in the Northern Union, appropriately called "Bradford Northern", which applied for and was granted Bradford FC's place in the 1907–08 Northern Rugby Football Union season. Bradford Northern's first home ground was the Greenfield Athletic Ground in Dudley Hill, to the south of the city. They based themselves at the Greenfield Hotel. Northern moved to Birch Lane in 1908. Bradford council offered the club a site for a new stadium between Rooley Lane and Mayo Avenue in 1927. However the NRFU said the site was too small and the club kept on looking. Before moving to Odsal, Bradford Northern had had two other homes at Greenfield Athletic Ground in Dudley Hill and at Birch Lane which was part of the Bowling Old Lane cricket ground, although at times they also had to hire Valley Parade as the capacity at Birch Lane was insufficient for large matches. On 20 June 1933 Bradford Northern signed a ten-year lease with Bradford council for a former quarry being used as a waste dump at Odsal Top. It was turned into the biggest stadium outside Wembley. The Bradford Northern team played its first match there on 1 September 1934. Success came to Bradford in the 1940s with a number of cup wins: the Yorkshire cup in 1940–41, 1942–43, 1944–45, 1945–46, 1948–49 and 1949–50; and the Challenge Cup 1943–44, 1946–47 and 1948–49. In the Championship Bradford found it difficult to win either before the war or after despite being runners up in 1942–43 and 1947–48. On Saturday 3 November 1945, Bradford Northern met Wakefield Trinity in the final of the Yorkshire Cup held at Thrum Hall, Halifax. Wakefield began the match as favourites, they had lost only one of thirteen matches thus far in the season. However, Bradford won 5–2 Frank Whitcombe scoring the try converted by George Carmichael and lifted the Yorkshire Cup for the fourth time in six seasons. Bradford defeated Leeds 8–4 to win the Challenge Cup Final at Wembley in 1947. The 1947–48 Challenge Cup final was notable as it was the first rugby league match to be attended by the reigning monarch, King George VI, who presented the trophy. It was also the first televised rugby league match as it was broadcast to the Midlands. Unfortunately Bradford lost 8–3 to Wigan and Frank Whitcombe became the first player to win the Lance Todd trophy on the losing side. The 1949 Challenge Cup final was sold out for first time as 95,050 spectators saw Bradford beat Halifax. In 1951–52 Bradford were runners up in the league but beat New Zealand at Odsal in the first floodlit football match of any code in the North of England. In 1953, a crowd of 69,429 watched Bradford play Huddersfield in the Challenge Cup's third round. This was Bradford's highest ever attendance. They also won the Yorkshire Cup final 7–2 against Hull. Bradford and Leigh were the first rugby league clubs to stage matches on a Sunday in December 1954, although there was opposition from the Sunday Observance lobby. Bradford's support declined rapidly in the 1963 season, attracting a record low crowd of 324 against Barrow. The club went out of business on 10 December 1963, having played just 13 matches; winning 1 and losing 12, scoring 109 points and conceding 284, the results were declared null and void, and expunged from the 1963–64 season's records. A meeting on 14 April 1964 saw 1,500 people turn out to discuss the formation of a new club, and those present promised a £1000 to help get plans for the new organisation underway. Amongst those who led proceedings were former players Joe Phillips and Trevor Foster. On 20 July 1964, Bradford Northern (1964) Ltd came into existence. The club's new side had been built for around £15,000 and had Jack Wilkinson as coach. On 22 August 1964, Hull Kingston Rovers provided the opposition in the reformed club's first match and 14,500 spectators turned out to show their support, as Odsal hosted its first 10,000 plus gate for a Bradford Northern match since 1957. The reformed club won its first cup in 1965–66 by beating Hunslet 17–8 in the final of the Yorkshire County Cup. In 1972–73 Bradford lost the Challenge Cup final against Featherstone Rovers 33–14. In 1973–74 Bradford won the Second Division Championship and were promoted back to the First Division. During this season Keith Mumby made his début, becoming the Bradford's youngest player at only 16 years of age, kicking 12 goals and scoring a try in the match against Doncaster. He went on to make a record 576 appearances for the club. In 1974–75 Bradford won the Regal Trophy 3–2 against Widnes. Peter Fox joined Bradford as coach for the first time in 1977–78. 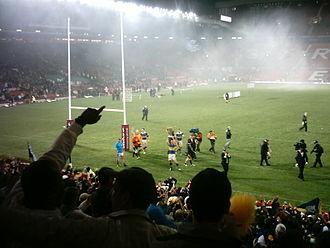 Bradford won the Premiership final 17–8 against Widnes and were also Championship runners-up. In 1978–79 Bradford appeared in another Premiership final this time losing 24–2 to Leeds. A year later Bradford won the Championship and Regal Trophy, Peter Fox winning the award for Coach of the Year. In 1980–81 the club made it back-to-back championships. In 1981–82, Bradford lost the Yorkshire Cup final 10–5 against Castleford and lost again in 1982–83, this time 18–7 against Hull F.C. Keith Mumby won the award for First Division Player of the Year while Brian Noble won the Young Player award. In 1985, Ellery Hanley left Northern to join Wigan for a then record transfer deal, worth £80,000 and a player exchange involving Steve Donlan and Phil Ford. By November 1987, Bradford had cash-flow problems and the local council refused to help financially, but appointed a special committee to administer the clubs' finances. In December 1987, desperate for cash, Bradford transfer-listed 22 players for a total of £210,000 plus Phil Ford for £120,000. In 1987–88 Bradford won the Yorkshire Cup final replay against Castleford 11–2 after drawing 12–12. Ron Willey coached Bradford Northern for a short stint in 1989–90 and led them to the Premiership final and success in the Yorkshire Cup final when they beat Featherstone Rovers 20–14. David Hobbs became coach at Northern in 1990 until he left for Wakefield Trinity in 1994. Bradford lost the Regal Trophy against Warrington 12–2 in 1990–91. Peter Fox returned to Bradford for a second spell as coach in 1991, and in 1993–94, Bradford finished as runners-up behind Wigan on points difference. Fox left the club in 1995. In 1996, the first tier of English rugby league clubs changed from a winter to a summer season and played the inaugural Super League season. Bradford dropped the 'Northern' name to become Bradford Bulls. Matthew Elliot took over as head coach in 1996. The Bulls won the Super League title in his first season. Elliot coached the Bradford Bulls to the 1999 Super League Grand Final which was lost to St Helens. Brian Noble was appointed Bradford head coach in November 2000. Noble took the Bradford Bulls to the 2001 Super League Grand Final in which they defeated the Wigan Warriors. As Super League VI champions, the Bulls played against 2001 NRL Premiers, the Newcastle Knights in the 2002 World Club Challenge. Noble oversaw Bradford's victory. He took the Bulls to the 2002 Super League Grand Final which was lost to St. Helens. Following an eighth consecutive defeat, the Bulls' worst run in Super League, McNamara's contract was mutually terminated on 13 July 2010. Lee St Hilaire was coach for the rest of the 2010 season. Mick Potter became coach in 2011. Despite the club being placed in receivership in 2012, the team was on the verge of making the semi-finals of Super League as Potter remained as unpaid coach. In March 2012 the club announced that it was in financial difficulties and needed £1 million to keep the club afloat. A public appeal saw a lot of new funds pour in from supporters, but following the issue of a winding up petition from HMRC for unpaid taxes the holding company for the club was forced to go into administration on 26 June 2012. The Rugby Football League announced that had the company been wound up then the team would be allowed to complete their fixtures for the 2012 Super League season under the possible ownership of a supporters trust. On 2 July 2012, the club's administrator, Brendan Guilfoyle, made sixteen members of staff, including the coach Mick Potter and chief executive Ryan Duckett, redundant, but announced that the club would attempt to fulfill its fixtures. Mick Potter continued as an unpaid coach until the end of the season. On 31 August 2012 a bid for the club from a local consortium, headed by Braford businessman Omar Khan, was accepted by the administrator and was ratified by the RFL in early September. Days later the RFL also granted the new owners a one-year probationary licence enabling the club to compete in Super League XVIII in 2013. Francis Cummins was appointed as head coach of the Bulls in September 2012. During the 2012/13 season the Bulls appointed Dr Allan Johnston to the backroom staff to support the players wellbeing and performance. This appointment was thought to be the first of its kind in Rugby League. In late December 2013 it was announced that chairman Mark Moore and directors Ian Watt and Andrew Calvert had resigned. In 2014, relegation was reintroduced to the Super League with two teams being relegated. Bradford were deducted 6 points for entering administration early on in the season and the Bulls were relegated from the top division of rugby league in Britain for the first time in 40 years. Francis Cummins was sacked around the time of relegation and replaced by James Lowes and won most of their remaining games. Bradford began their first Championship campaign in 40 years against Leigh away where they narrowly lost the game. By the end of the regular season they entered the Super 8s finishing second. In the Qualifiers Bradford failed to make the top three for automatic entry to Super League for 2016, finishing 5th which meant a trip to Wakefield to play them in the first ever Million Pound Game. Bradford would lose 24–16, condemning them to a second year in the Championship. On 14 November 2016, Bradford Bulls were placed in administration for the third time since 2012. On 16 November, the RFL cancelled Bradford's membership, making their future uncertain. In the ensuing weeks several bids to buy the club were made but despite one bid being acceptable to the RFL, none were accepted by the administrator and the club went into liquidation on 3 January 2017. While a number of alternatives were considered the Board was most mindful of the planning already undertaken by all other clubs in the competition structure, the season tickets already purchased and the players and staff who will now be seeking employment in and around the sport in 2017. Accordingly the Board has agreed that the wider interests of the sport is best satisfied if it offers a place in the Kingstone Press Championship to any new club in Bradford and that such a club start the 2017 season on minus 12 points. The RFL believes that Rugby League needs Bradford and that Bradford deserves a strong and stable professional club and will work with all interested parties to deliver that outcome. After the Bulls went into liquidation in January 2017 the Rugby Football League (RFL) invited bids to form a new club based in Bradford who would be allowed to take the place of the Bulls in the 2017 Championship but would start with a 12-point penalty deduction. The RFL issued a set of criteria for anyone wishing to bid for the new club and there were 12 expressions of interest of which four were converted into bids submitted to the RFL. On 13 January the RFL announced that a consortium to run the new club had been selected an notified of the decision. The new owner was publicly announced on 17 January as Andrew Chalmers, the former chairman of the New Zealand Rugby League. Also involved is former player and coach, Graham Lowe. The parent company of the club is registered as Bradford Bulls 2017 Limited at Companies House, and the team continue to be known as Bradford Bulls, also retaining the club colours, stadium and several players from the 2016 squad. On 20 January 2017 Geoff Toovey was named as coach and Leon Pryce as captain. However, a delay in processing his paperwork left Toovey unable to fulfil his role and led to Leigh Beattie being appointed as interim coach. Odsal Stadium has been the home ground of Bradford Northern/Bulls since 1934. Odsal has also hosted many other sports, including association football, speedway, stock car racing, basketball, featuring the Harlem Globetrotters, wrestling, show jumping and kabaddi. The stadium's largest attendances was 102,569, when Halifax played Warrington on 5 May 1954 in the Challenge Cup Final replay. From 9 November 2012, the Bulls sold the naming rights again to local business Provident Financial, and the stadium was renamed the Provident Stadium. The deal with Provident was ended in February 2018. Up until the Super League era the club was known as Bradford Northern and used the Bradford city coat of arms. When the club was rebranded Bradford Bulls the crest was changed to a similar design to that of the Chicago Bulls. Bradford's playing colours were red, yellow, black and white. Bradford's strips were predominantly white with a red, yellow and black band. Bradford's main rivals are Leeds Rhinos who they've played in multiple finals, especially during the early years of Super League as well as St Helens whom they faced in two successive Challenge cup finals during the golden era. They also have a lesser local rivalry with Keighley Cougars although this was considered a one-way rivalry and competitive fixtures were rare as they played in different divisions. They also have other local rivalries with Huddersfield Giants and Halifax. The Harry Sunderland Trophy is awarded to the Man-of-the-Match in the Super League Grand Final by the Rugby League Writers' Association. The Lance Todd Trophy is awarded to the Man-of-the-Match in the Challenge Cup Final. Introduced in 1946, the trophy was named in memory of Lance Todd, the New Zealand-born player and administrator, who was killed in a road accident during the Second World War. The Steve Prescott Man of Steel Award is an annual honour, awarded by the European Super League to the most outstanding player in the British game for that year. This list contains the players who played in the Challenge Cup, Grand Final. ^ "Bradford's fog-bound winters give way to glorious summer". The Guardian. 17 October 2005. Retrieved 28 February 2017. ^ "Operational Rules". RFL. Retrieved 10 March 2017. ^ "Bradford Bulls go into administration and faced 'extinction'". BBC Sport. 26 June 2012. Retrieved 26 June 2012. ^ "Bradford Bulls deducted six points as takeover collapses". BBC Sport. BBC. 25 February 2014. Retrieved 3 April 2014. ^ "Bradford Bulls chairman Marc Green puts club into administration again". Bradford Telegraph & Argus. 14 November 2016. Retrieved 14 November 2016. ^ a b "Bradford Bulls: Former Super League champions liquidated". BBC Sport. 3 January 2017. Retrieved 3 January 2017. ^ "RFL assesses four bids to set up new club after Bradford's liquidation". The Guardian. 9 January 2017. ^ Dave Hadfield (20 December 1995). "Rugby's pounds 87m deal gives Murdoch transfer veto". The Independent. Retrieved 6 May 2009. ^ "Super League Team-by-team guide". telegraph.co.uk. London: Telegraph Media Group Limited. 1 March 2001. Retrieved 10 October 2010. ^ "PMcNamara is Bulls new head coach". Bradford Bulls. 20 April 2006. Archived from the original on 24 February 2012. Retrieved 1 January 2012. ^ a b "Bradford Bulls 'need £1m' to stay in business, as support pours in". BBC Sport. 27 March 2012. Retrieved 28 June 2012. ^ "Bradford Bulls go into administration and face 'extinction'". BBC Sport. 26 June 2012. Retrieved 28 June 2012. ^ "Bradford Bulls can finish season – even if liquidated". BBC Sport. 27 June 2012. Retrieved 28 June 2012. ^ Ian Laybourn (2 July 2012). "Bradford Bulls make 16 redundancies, including head coach Mick Potter". The Independent. Retrieved 3 July 2012. ^ "Future of Bradford Bulls resolved as Omar Khan buys club". The Guardian. 1 September 2012. Retrieved 1 September 2012. ^ "Bradford Bulls: Omar Khan takeover ratified by RFL". BBC Sport. 12 September 2012. Retrieved 15 September 2012. ^ "Bradford Bulls: RFL grants club Super League licence". BBC Sport. 14 September 2012. Retrieved 15 September 2012. ^ Ian Laybourn (17 September 2012). "New Bradford Bulls head coach Francis Cummins is ready to work with limited resources". The Independent. Retrieved 18 September 2013. ^ "Bulls star Mellor targeting unbeaten end to campaign". Telegraph & Argus. 29 July 2016. Retrieved 6 December 2016. ^ "Bradford Bulls: Championship club placed in administration for third time". BBC Sport. 14 November 2016. Retrieved 14 November 2016. ^ "Bradford Bulls go into liquidation – MP Judith Cummins demands an investigation". Telegraph & Argus. 3 January 2017. Retrieved 3 January 2017. ^ "RFL assesses four bids to set up new club after Bradford's liquidation". The Guardian. 9 January 2017. Retrieved 13 January 2017. ^ "RFL finalises deal with unnamed bidder for Bradford Bulls replacement". The Guardian. 9 January 2017. Retrieved 13 January 2017. ^ "Andrew Chalmers and Graham Lowe named new Bradford club owners". BBC Sport. 17 January 2017. Retrieved 17 January 2017. ^ "Geoff Toovey: Australian named coach of new Bradford Bulls". BBC Sport. 20 January 2017. Retrieved 20 January 2017. ^ "'Things are starting to fall into place' – Leigh Beattie on Bradford Bulls progress". Telegraph & Argus. 26 February 2017. Retrieved 28 February 2017. ^ "Bradford Bulls eye new stadium sponsors after Provident Financial partnership ends". Telegraph & Argus. 12 February 2018. Retrieved 13 February 2018. ^ "Callum Bustin joins Bradford Bulls on loan". Telegraph and Argus. 14 December 2017. Retrieved 15 January 2018. ^ "Bradford Bulls sign Castleford centre Jake Webster". Telegraph and Argus. 21 August 2018. Retrieved 26 September 2018. Apperley Bridge is a village in the metropolitan borough of the City of Bradford, in West Yorkshire, England. Apperley Bridge is north-east of Bradford on the boundary with the City of Leeds bounded in the east by Carr Beck, the village straddles the Leeds and Liverpool Canal and the River Aire. It takes its name from the old bridge over the river on Apperley Lane, parts of Rawdon in Leeds of similar character are included in the BD10 Apperley Bridge postal district. The bridge from which the village takes its name was built in the century or early-17th century. In 1777 a stone arched bridge was built on Harrogate Road over the canal, from 1846 until its closure in 1965, Apperley Bridge railway station was situated across the boundary in Rawdon. Off Tenterfields close to the canal were four 19th-century mills, Apperdale Mill, Oaklea Mills, Valley Mills, Apperdale Mill and Oaklea Mills survive close to the canal basin, which is now a pleasure boat marina. Since the 1990s housing has been built in the Tenterfields area between the canal up to Greengates, Valley Mills and Whitfield Mills were demolished to make way for the development, while Apperdale Mill and Oaklea Mill were converted into residential units. Hammonds sauce factory on Harrogate Road close to the canal has been replaced by modern development, in the 2000s the village was considered for conservation area status but was turned down partly because many of its older buildings already had listed building status. Apperley Bridge is in the Idle and Thackley ward, on Apperley Lane is the head office of JCT600 vehicle hire and dealership. Next to the Harrogate Road bridge over the Leeds and Liverpool Canal is Apperley Bridge Quarries, on the canal itself is Apperley Bridge Marina with a cafe and chandler operated by Calder Valley Marine. 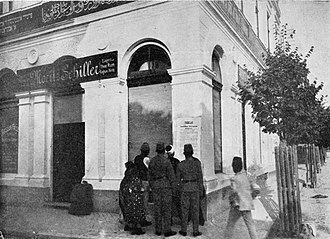 Regarding leisure and tourism there are cafes and historic public house / restaurants in the area. The old bridge from which Apperley Bridge takes its name is of ashlar construction with two arches and a partially obliterated inscription by the road edge, numerous farm buildings and previously canal related buildings along Apperley Road near Millman Bridge have listed building status. The Dog and Gun, The George and Dragon, * and The Stansfield Arms* public houses are historic houses, farmhouses. Peel Park is a 22. 6-hectare urban public park in the Bolton and Undercliffe area of Bradford, located about 0.75 miles north-east of the city centre, and named after Sir Robert Peel. Peel Park was Bradfords first public park and is on the English Heritage and National Register of Historic Parks, the park is a Green Flag Award winner and has been for a number of years. The park was opened in 1853 and a series of galas were held in the park to raise funds to pay off the debt for the purchase of the land. In 1870 the park was conveyed to the Municipal Borough of Bradford, money was raised for local hospitals by the galas until 1936 when the last gala was held. In the 1900s the park lake had an ornamental fountain. Slightly higher and to the east of the lake, separated by low cascade was a smaller lake remodelled from a fish pond. To the north east of the lake was a fossilised tree, in 1902 a ornamental bandstand was erected midway along The Terrace but today this location is occupied by the statue of Sir Robert Peel. Another lost feature is the two cannons captured by the British in the Crimean War, the park had a total of four drinking fountains but two have been lost. The park had its own plant nursery south of the western entrance at Bolton Road with computer controlled greenhouses. In 1997 Bradford Citys centenary year,100 trees were planted in the park, the southern Cliffe Road entrance has ornate gates and a lodge but larger and more impressive are the main gates and lodge at the northern Bolton Road entrance. There are two grade II listed two-storey Italianate lodges, one at the gates on Bolton Road. The main linear path through the park is The Terrace extending east west on which can be found a number of statues. One such is a statue of Sir Robert Peel made in 1855 and dressed in a mid 19th century frock coat, the sculptor was W. Behnes and the statue was cast in lead by the Robinson Scott Company of Pimlico. To the west of the Peel statue is a statue of a Roman matron representing Autumn. All three statues are grade II listed, at the western end of The Terrace is the Viewing Platform giving views over the Bradford valley and Manningham. Salford Red Devils R. L. F. C. is a professional rugby league club in Salford, Greater Manchester, who play in the Super League. Formed in 1873, they have won six Championships and one Challenge Cup and their home ground since 2012 has been the AJ Bell Stadium in Barton-upon-Irwell, before which they played at the Willows in Weaste. Before 1995, the club was simply as Salford, from 1995-98 Salford Reds. On a 1934 tour to France, the described the team as playing like devils. The club was founded in 1873 by the boys of the Cavendish Street Chapel in Hulme, using a local field, the boys organised matches amongst themselves before moving to nearby Moss Side. 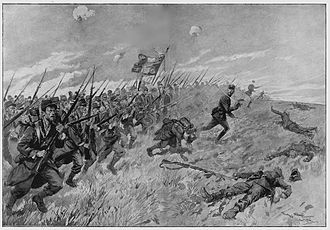 In an attempt to recruit new members, the link with the school was broken in 1875 and they moved to a new base on the Salford side of the River Irwell at Throstle Nest Weir in Ordsall. Two seasons later, they moved again to the west side of Trafford Road to a known as the Mile Field where they spent the 1877–78 season. Their next home was a north of the former Manchester Racecourse. Their first season there, 1878–79, was the last to be played under the Cavendish name, Cavendish became Salford Football Club in 1879. The first match as Salford was at Dewsbury on 4 October 1879, the following week heralded the first home match at New Barnes against Widnes, on 11 October 1879. The result was a draw with one try each, Salford struggled to attract support as there were few local players in the team. In 1881, they almost disbanded but instead merged with the Crescent Football Club, since the 1881 merger, only 62 matches were lost from 263 played in the remaining nine years of the decade. In 1889, Salford moved their headquarters to the nearby London, Salford switched from their traditional amber and scarlet hoops to red jerseys. 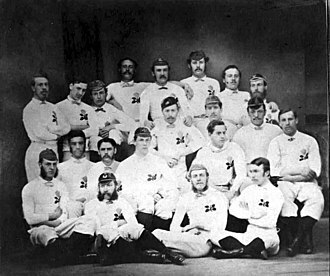 The club became the first side to win the Lancashire League in 1892–93, only three members opposed the motion. Salford were admitted to the Northern Union on 2 June 1896 and their first competitive Northern Union match was on Saturday,5 September 1896, with a visit to Widnes. The George Hotel in Huddersfield, West Yorkshire, England, is a Grade II listed building famous as the birthplace of rugby league football in 1895. The 60 bed hotel was built in 1851 and closed in January 2013, the three-star rated George Hotel, which has an Italianate façade, was designed by William Walker. The Victorian era hotel was built around 1851, in 1922 this became the Rugby Football League. Stockport was accepted into the league via telephone to the hotel, memorabilia recalling the meeting can be found throughout the hotel as well as in the Heritage Centre. The British Amateur Rugby League Association was founded at the George Hotel in 1973, the Rugby League Heritage Centre was located in the basement of the George. It was the UK’s only rugby league heritage museum and it was the brainchild of sports presenter Mike Stephenson. The Rugby League Heritage centre was opened on 30 August 2005 by former players Billy Boston, Neil Fox, within the centre were displays of memorabilia, including rare jerseys, caps and photographs. Rugby is a type of football developed at Rugby School in Rugby, one of many versions of football played at English public schools in the 19th century. The two main types of rugby are rugby league and rugby union, although rugby league initially used rugby union rules, they are now wholly separate sports. Following the 1895 split in rugby football, the two rugby league and rugby union differed in administration only. Soon the rules of rugby league were modified, resulting in two different forms of rugby. After 100 years, in 1995 rugby union joined rugby league, the Greeks and Romans are known to have played many ball games, some of which involved the use of the feet. These games appear to have resembled rugby football, the Roman politician Cicero describes the case of a man who was killed whilst having a shave when a ball was kicked into a barbers shop. Roman ball games already knew the air-filled ball, the follis, episkyros is recognised as an early form of football by FIFA. In 1871, English clubs met to form the Rugby Football Union, in 1892, after charges of professionalism were made against some clubs for paying players for missing work, the Northern Rugby Football Union, usually called the Northern Union, was formed. The existing rugby union authorities responded by issuing sanctions against the clubs, after the schism, the separate clubs were named rugby league and rugby union. Rugby union is both a professional and amateur game, and is dominated by the first tier unions, Australia, France, Italy, New Zealand, South Africa and Wales. Rugby Union is administered by World Rugby, whose headquarters are located in Dublin and it is the national sport in New Zealand, Fiji, Samoa and Madagascar, and is the most popular form of rugby globally. The Olympic Games have admitted the seven-a-side version of the game, known as Rugby sevens, there was a possibility sevens would be a demonstration sport at the 2012 London Olympics but many sports including sevens were dropped. In Canada and the United States, rugby union evolved into gridiron football, during the late 1800s, the two forms of the game were very similar, but numerous rule changes have differentiated the gridiron-based game from its rugby counterpart. Rugby league is both a professional and amateur game, administered on a level by the Rugby League International Federation. Bradford /ˈbrædfərd/ is in the Metropolitan Borough of the City of Bradford in West Yorkshire, England, in the foothills of the Pennines 8.6 miles west of Leeds, and 16 miles northwest of Wakefield. Bradford became a borough in 1847, and received its charter as a city in 1897. Following local government reform in 1974, city status was bestowed upon the metropolitan borough. Historically a part of the West Riding of Yorkshire, Bradford rose to prominence during the 19th century as a centre of textile manufacture. It was a boomtown of the Industrial Revolution, and amongst the earliest industrialised settlements, the textile sector in Bradford fell into decline from the mid-20th century. However, Bradford has faced challenges to the rest of the post-industrial area of Northern England, including deindustrialisation, social unrest. It was recorded as Bradeford in 1086, after an uprising in 1070, during William the Conquerors Harrying of the North, the manor of Bradford was laid waste and is described as such in the Domesday Book of 1086. It became part of the Honour of Pontefract given to Ilbert de Lacy for service to the Conqueror, there is evidence of a castle in the time of the Lacys. The manor passed to the Earl of Lincoln, John of Gaunt, The Crown and, ultimately, by the middle ages Bradford, had become a small town centred on Kirkgate and Ivegate. In 1316 there is mention of a mill, a soke mill where all the manor corn was milled. During the Wars of the Roses the inhabitants sided with House of Lancaster, Edward IV granted the right to hold two annual fairs and from this time the town began to prosper. In the reign of Henry VIII Bradford exceeded Leeds as a manufacturing centre, Bradford grew slowly over the next two-hundred years as the woollen trade gained in prominence. During the Civil War the town was garrisoned for the Parliamentarians, Sir Thomas Fairfax took the command of the garrison and marched to meet the Duke of Newcastle but was defeated. The Parliamentarians retreated to Bradford and the Royalists set up headquarters at Bolling Hall from where the town was besieged leading to its surrender, the Civil War caused a decline in industry but after the accession of William and Mary in 1689 prosperity began to return. The Rugby Football Union is the governing body for rugby union in England. It was founded in 1871, and was the international governing body prior to the formation of what is now known as World Rugby in 1886. It promotes and runs the sport, organises international matches for the England national team and it is based at Twickenham Stadium, London. In September 2010 the equivalent womens rugby body, the Rugby Football Union for Women, was able to nominate a member to the RFU Council to represent women, the RFUW was integrated into the RFU in July 2012. On 26 January 1871 a meeting attended by representatives from 21 clubs was held in London at the Pall Mall Restaurant on Regent Street. C, kings College Hospital, St Pauls, Queen’s House, Addison and Belsize Park. The one notable omission was the Wasps, as a result of this meeting the Rugby Football Union was founded. Algernon Rutter was elected as the first president of the RFU, three lawyers who were Rugby School alumni drew up the first laws of the game, which were approved in June 1871. The RFU took strong action against the involved in the formation of the NRFU, all of whom were deemed to have forfeited their amateur status. A similar interpretation was applied to all players who played either for or against such clubs and these players were barred indefinitely from any involvement in organised rugby union. The RFU long resisted competitions and leagues fearing that they would encourage foul play, the first club competition, known as the R. F. U. Club Competition, took place in 1972, following a sponsorship agreement it became known as the John Player Cup in 1976. The RFU agreed to the formation of a pyramid in 1987. In 2005 the RFU began talks about a merger with the body for womens rugby union the RFUW. In September 2010 the RFUW was able to nominate a member to the RFU Council to represent women, the RFUW was integrated into the RFU in July 2012. Andrew had the task of building bridges with the premiership clubs, on 6 January 2011 his role of Director of Elite Rugby was scrapped in an overhaul of the organisations structure. Titus Salt's mill in Saltaire, Shipley is an UNESCO World Heritage Site.